The experienced team at Cairn Custom Homes looks forward to working with you! Lisa is focused on working with our clients to create a home that reflects their personal tastes and captures the elements that are important to them. She works with our clients to facilitate the selections process from both a design and organizational perspective, and also works closely with our contractors and project manager to help the flow of information vital to the building process. Lisa earned a Bachelor of Science in Marketing from the University of Maryland, and worked as the Selections Coordinator for Selfridge Builders and Goodier Builders/Goodier Baker Homes prior to founding Cairn Custom Homes. Steve oversees all aspects of Cairn Custom Home’s design and building process from client meetings, lot feasibility assessment, conceptual home design through final architecture, structural engineering, civil engineering, production, quality control and on through Customer Service. Steve’s experience in residential homebuilding dates back to 1979 and in these intervening years Steve has been responsible for the construction of over 1,500 single family homes, townhomes and mid-rise condominiums. Steve has been on several local Boards of Directors including Habitat for Humanity – Howard County, Preservation Howard County and the Howard County Historical Society. Steve holds a BA from the University of Maryland, Baltimore County. He grew up in West Friendship in western Howard County and has remained a life-long Howard County resident. Steve and Lisa, wife and partner, have five adult kids between them. They enjoy travel to visit their kids scattered around the country and beyond, and to their small cabin at Deep Creek Lake for quiet weekends. Jeff has over 18 years in the construction industry, a majority of that time spent as a Project Manager, overseeing every aspect of the building process. He understands the complexities and extreme level of detail that go into constructing a truly unique home, and has a proven track record of delivering a high quality product while maintaining a fluid construction program to keep the job on schedule. Jeff personally meets every client on-site and addresses construction questions directly with buyers. Jeff currently resides in Walkersville, MD with his family. Jeff is an avid sports fan and cheers on the side lines of his daughter’s lacrosse games every chance he can get. Heidi brings over 30 years of experience to the administrative and accounting team at Cairn. From her years at the Federal Bureau of Investigation, to the successful business she owned with her husband, she’s able to handle management functions and all bookkeeping tasks. She brings a very detailed oriented aspect to the team. She is focused on troubleshooting and efficiently solving problems in a timely and professional manner. Heidi grew up in Baltimore County, and attended Catonsville Community College. In her free time, she loves to be with her 6 children and 4 grandchildren. She enjoys cooking and trying new recipes. She now resides in Shiloh, PA.
Jasmine Strain, Sales & Client Relations. Jasmine joins the Cairn Custom Homes team with a background in residential real estate. She holds her real estate license at Keller Williams Realty Centre in Columbia and is able to assist clients in finding lots or raw land to purchase. She loves working with people and helping clients navigate the custom home building process from start to finish. Jasmine holds a B.F.A from the University of the Arts in Philadelphia and grew up in Catonsville, MD. She currently resides in Clarksville, Maryland with her husband, son and two dogs. Ron has been in the home building industry for over 17 years, holding various design and project management roles. He is directly involved and passionate about providing great service with accurate and timely pricing to every client. Ron strives to evaluate the specific needs of every home and recognizes the value of direct communication and trust with our vendors. Ron grew up in West Friendship and currently resides in Mt. Airy. He graduated from Glenelg Highschool, attended Howard/Catonsville Community Colleges and University of Maryland Baltimore County. When not in the office, Ron is an adventurer and a family man. You can find him exploring and photographing the outdoors backpacking, running, or mountain biking with his wife and son. "We began the process with Cairn saying we wanted a house that was not too big, but very detailed. Even with that warning, I don’t imagine they realized what they were in for! Every aspect of our house was unique, from the floor plan down to the cabinet hardware. When you’re building a house that’s never been built before you have to be prepared for many complications, but Steve, Lisa, Jeff, and Sarah were ready and willing to handle anything that came up, and truly seemed to enjoy the challenge. They were very organized with their schedule, Sarah kept us informed regarding what selections we should be focused on next, and our weekly construction meetings were always enjoyable. In addition, their love of home design and in-depth knowledge of construction was apparent every step of the way. Now that we’re living in the house, we couldn’t be more thrilled with the way it turned out!" "We couldn’t be happier with our new home, or with the team at Cairn Custom Homes who helped us bring our dream to life. They spent so much time with us and we received their attention and feedback at every step of the way. Each request and idea we had was welcomed and incorporated into the plan, inside and out. We had a very particular and unique design in mind, and with the teams expert guidance, we were able to create a truly inspired home that suites our family’s wants and needs. We would highly recommend Cairn Custom Homes to any of our friends and family!" 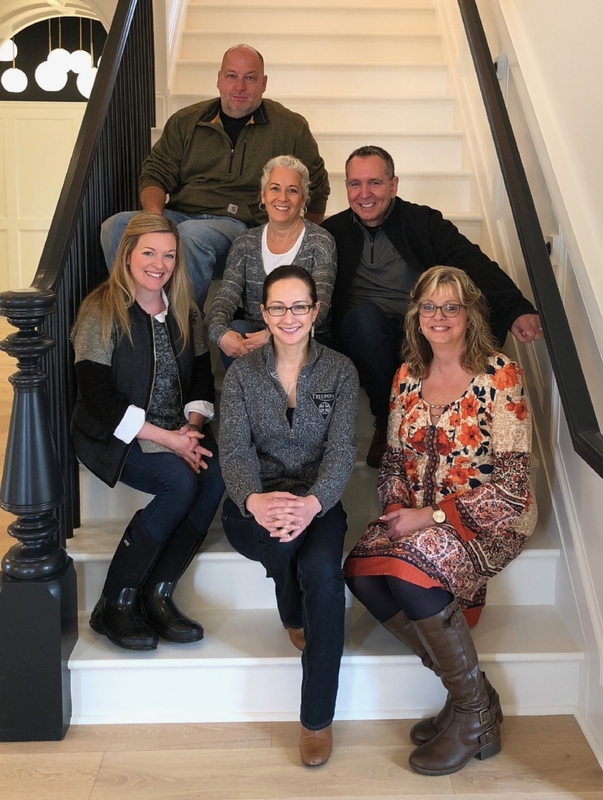 "Our home building experience was very calm and pleasant thanks to the knowledge and dedication of Steve Appler, Lisa Rosenthal, and Joanie McCann. From our very first meeting, it was evident that they were committed to building a home that matched our style and vision. Steve Appler was supremely knowledgeable of the architectural details and structural design. Lisa Rosenthal was a wealth of knowledge with respect to home selections and interior details. Joanie McCann kindly offered any and all assistance with the overall coordination of the building process. Steve, Lisa, and Joanie were extremely patient with us when we had revisions and questions. When issues did arise, they were resolved quickly, but with careful thought. When you start out on the journey of building a home, you anticipate the long wait and aggravation of so many decisions, but we personally enjoyed the entire process. We found it exciting, and the patience and kindness of Steve, Lisa, and Joanie contributed immensely to our happiness and satisfaction."